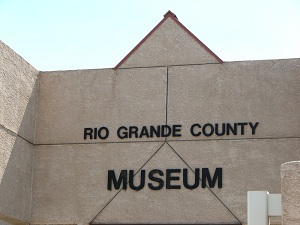 The Rio Grande County Museum is located at 580 Oak Street in Del Norte (which is a half block south of the only street light in town and on the east side of the street). The hours of the museum are Tuesday through Friday 10:00 a.m. – 4 p.m. and on Saturday from 10:00 a.m. – 2 p.m. I (Debbie) found the Rio Grande County Museum to be quite interesting with its many displays. When you first enter the room of the museum there is a human hair wreath dated back to 1859. 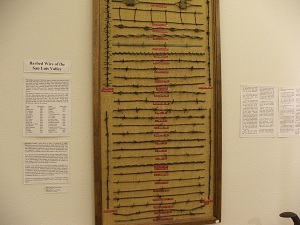 There is a display on the wall of the different types of barbed wired that are used in the San Luis Valley. I had no idea there were so many different types. There is a nice display on Albert Henry Pfeiffer who was born in 1822 in Friesland, Netherlands. He moved to the United State at 22 years old in 1844 and served as a Ute Indian agent. Colonel Pfeiffer has a grave here in the San Luis Valley just northwest of Del Norte. A display featuring “mourning jewelry” was very fascinating. Its earliest record dates to the 1400’s and 1500’s. This jewelry was a souvenir to remember a loved one who had died in battle. The use of mourning jewelry increased significantly in the 1860’s due to the Civil War. There is a display on mining primarily because of the Summitville Mine which is south of Del Norte. 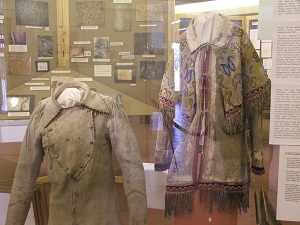 Displayed are baby clothing, a mineral collection, a kitchen setting, a bride and groom’s clothing, among many other exhibits. There is information on the early Hispanic settlements which spoke of La Loma de San Jose who came to the San Luis Valley because of two large land grants—the Sangre de Cristo Grant east of the Rio Grande River and the Guadalupe Land Grant west of the Rio Grande River. The purpose of the early settlements was to protect Mexico’s holdings in Colorado from the French and the Americans. 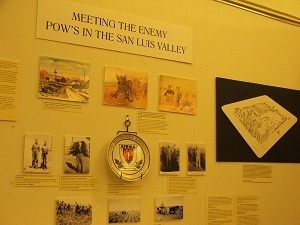 I especially enjoyed reading about the German POW’s in Monte Vista. They arrived in the San Luis Valley on October 3, 1943, from a base camp near Trinidad, Colorado and came to help with potato harvest and sugar beet harvest. During the time the POW’s were housed in Monte Vista, the Ski High grounds were used for POW athletic events. 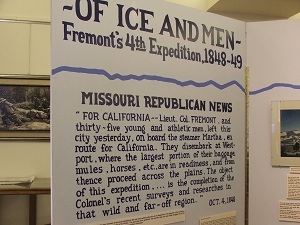 One display I liked was reading about John C. Fremont, who was sent to find a route for a railroad to head west. He and his men were caught in a blizzard with snow up to 14 feet deep while trying to cross a 12,000 foot pass. Many men’s noses bled due to the elevation. They were forced to take shelter in December 1848. The camp they named, Camp Despair. On December 27, the party decided to split up. They were never together again and the first man died on January 9, 1849 by collapsing under frozen legs. On January 17, rescue came but not before the loss of 100 mules, ten men’s lives, and $10,000. I enjoyed the Rio Grande County Museum and seeing an old friend, Shirley, who was volunteering her time at the Museum. Don’t miss it during you stay in the Valley.